Thunderbird 60.5.0 was released on January 29, 2019. The new version of the cross-platform email client introduces search engine improvements, integrates WeTransfer for file attachment uploads, and improves integration of Microsoft Exchange accounts. Thunderbird users can run a check for updates to install the new version of the email client directly; just select Help > Check for Updates to run a manual check for updates. The new Thunderbird 60.5.0 is also available as a standalone download from the official project website Thunderbird.net. Tip: It is recommended that you back up Thunderbird data, e.g. by using MailStore or a backup software, before you upgrade the email client to a new version. Thunderbird users who use integrated file hosting services to upload large attachments may select WeTransfer for that as well now in the latest version. Thunderbird introduced support for file hosting services in 2012 to improve the sending of large files natively. Email providers restrict the size of email messages and users who need to send emails that exceed the size need to find another way to transfer these. 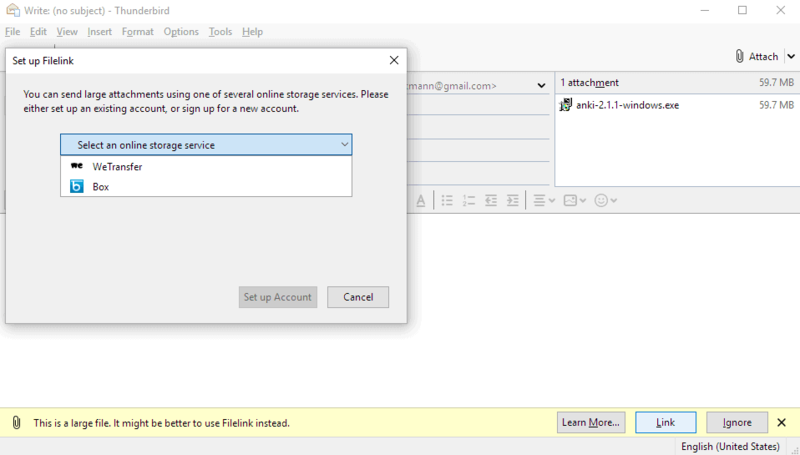 One option in Thunderbird is to pick one of the available providers to upload file attachments to these providers and embed links to the uploaded files in emails. A suggestion to use filelink is displayed if the size of an email exceeds a certain size. Click on "link" on the screen and select one of the available storage services. It is necessary to create a free account at the service the first time it is selected. Thunderbird supports WeTransfer and Box at the time of writing natively; users may extend the functionality with add-ons to integrate other providers such as Dropbox; this is another new feature in Thunderbird 60.5.0. 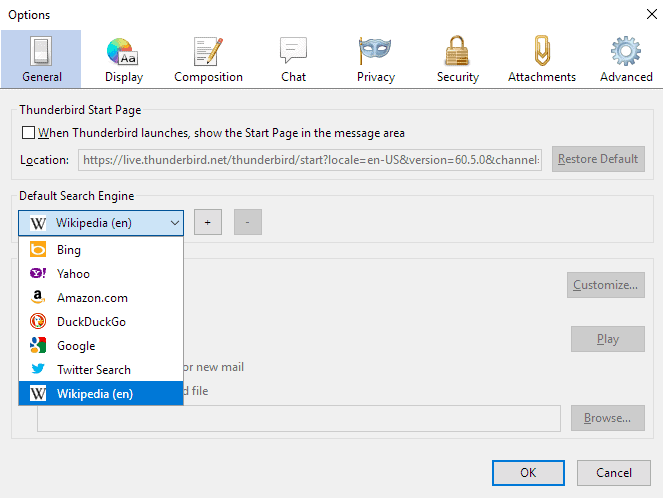 The Thunderbird team improved the email client's search functionality in the new release. Thunderbird users may right-click any text in an email to select a search option from the context menu. Searches open in the default web browser. The search functionality supports the OpenSearch protocol in the new version of the email client which makes it easier to add new search engines to the listing. Support for Google and DuckDuckGo has been added as well in some locales. You find options to set the default search engine and add new search engines under Tools > Options > General > Default Search Engine. Thunderbird detects servers supporting the Microsoft Exchange protocol automatically during account creation and prompts users to install the third-party Owl add-on to add support for that protocol to Thunderbird. Thunderbird 60.5.0 includes security fixes and a crash fix next to all that. Twitter chat is still not working. CalDav access is not working to some servers. Workaround is to set the preference preference network.cookie.same-site.enabled to false. Mozilla Platform profiles stored on Windows network shares are addressed via UNC. Here is a link to the release notes of Thunderbird 60.5.0. Now You: Do you use Thunderbird? What is your take on the direction the email client is taking? Thunderbird 60.5.0 was released on January 29, 2019. The new version of the cross-platform email client introduces the following new features. 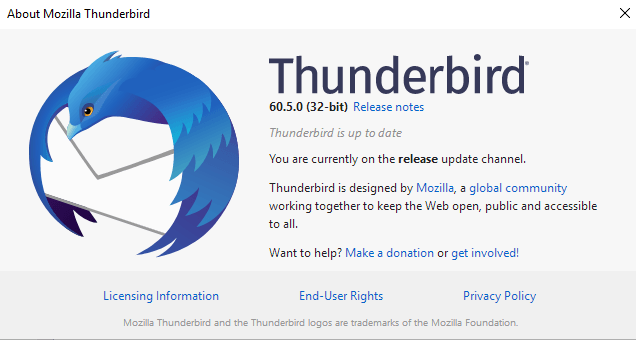 >The new Thunderbird 60.5.0 is also available as a standalone download from the official project website Thunderbird.net. I don’t understand what that means. Thunderbird has always been standalone, no? I meant that you can download the full installer from the project website to install or upgrade using it. Wish people still remember SeaMonkey xD. I remember Seamonkey. It’s a suite, though, not a standalone email client. Martin, open search search plugins, selecting them, and searching from a context menu item on any highlighted text in a content area has been a thing for years.. Could you please clarify what has changed? Sure, the change in regards to OpenSearch is that you can now add search engines from a local XML file “using a minimal user inferface: [+] button to select a file an add, [-] to remove”. I see, they added a UI.. Neat.. UXP uses a modified and ported search service for all applications, except Basilisk, that still stores and accepts the xml files in the profile location.. I should add a UI to do something similar to Interlink Mail & News at some point.. Attachments using wetransfer seem not working, could someone confirm this? Yes, I use Thunderbird. The changes in this release are fine. None of the new features are of interest to me (I just use it to read and send email, nothing more), but I don’t mind if they’re there. Its the last version to support calendar integration with Funambols Thunderbird Plugin. This gives me 2-way sync between laptop, mobile phone and desktop. Keeping data on 3 devices up-to-date automatically via SyncML. Does anyone know of a replacement SyncML server ? Is SyncML even a thing these days ? Progress may not always be…. @C – not laughing at all. It’s the last Thunderbird I liked too. Once tabs and indexing were brought in, I hated it. I actually like Interlink so far, but I just use Windows Mail (yes from Vista). I just force it to register on Windows 8, and in fact, Windows Mail and Calendar work better on Windows 8 than they do on Vista. I wish I hadn’t upgraded as well. Bringing tabs in, specifically, was a horrible, horrible thing. > I wish I hadn’t upgraded as well. Bringing tabs in, specifically, was a horrible, horrible thing. One man’s trash is another man’s treasure (pardon the sexism). So for those of use who hate multiple application windows (because who doesn’t already have too many windows open? ), and never used multiple windows of Thunderbird, tabs was and is a wonderful, wonderful thing. I am certain I am not alone. Just because you don’t like something doesn’t mean it is the kiss of death – unless I am mistaken Thunderbird doesn’t force you to use tabs. Thunderbird doesn’t force you to use tabs for dealing with individual emails, but it does force you to use tabs for search results, the preferences page, etc. You’re right, tabs vs no tabs is a matter of taste. I don’t wish that tabs didn’t exist, but I dearly wish I could disable them. They are my #1 complaint about Thunderbird. That said, it certainly doesn’t stop me from using Thunderbird. But that only addresses showing email messages themselves in tabs (I’ve had that disabled for years), it doesn’t stop the use of tabs for everything else. @C, I don’t chuckle and if I did at a time when I believed that anything new was systematically better, I don’t anymore because obviously time may be on the side of business but, because business is what it is, less and less on the side of users, consumers. Progress is a blend of poison diluted in the finest Whiskey. Slowly but surely Thunderbird will be catching up with Firefox’s Webextensions and complexity; I won’t have the energy to tweak Thunderbird as I try to optimize Firefox, mainly regarding privacy issues. I’m bound to use Webmail exclusively, I think it’s a matter of time only. @joni I’m in no wander when it comes to browsers and Firefox in particular, and I have no choice than to search and often find the best available settings that there is no alternative to a browser. But an email client is different because one can manage email otherwise, a webmail provider. Because there is this alternative I have in mind that I’m likely to abandon an email client for a webmail provider, free of updates, free of settings and tweeks. I love, i’ve loved getting the best of a browser but I admit a certain fatigue, bypassed because there’s no alternative and if there where i’d spend more time elsewhere than continuously improving, searching, adjusting, brain-storming every six weeks on what I should do about latest versions. No choice. From there on and considering Thunderbird is bound to fly as a fox hunts I just think I won’t have, won’t be willing to carry on with Thunderbird as i do with Firefox, with browsers. My limit. Yeah, I use T Bird, have for years. None of the new features in this or the last update mean anything to me, just want an email client, not another piece of software trying to be a browser. I guess we’ll see update after update now with more behind the scenes settings that can’t be changed. I’m looking for something else. Thanks for not laughing too hard. @ULBoom : You could go back to 2.0.0.24 if you like ? Not sure about using a current inbox with an older version. On the funambol front, if anyone is good with Java and Tomcat it’d be great to hear from you. I need to bring Java8 to Tomcat and then get Funambol server working on top. Why wont the gods promote SyncML…. I lament. I will re-invigorate my search for the solution now…. Apologies…. I am on Windows 8.1 with a ‘better’ StartMenu. I’m wanting to run Java at least at 1.8 on any Tomcat really, but 7 is latest stable ? I clearly need schooling here…. I think that the link I provided should help you. You have indeed helped ! I got the whole shooting-match working again. In short I have SyncML for 3-way device synching of Contacts and Appointments ! I’ll make damn sure I visit this place regularly now…. its a gold-mine ! Same here, there’s nothing for me in the recent upgrade of thunderbird, while stuff that seems obivous and required are still missing or removed. I’m afraid thunderbird is following firefox on the path to irrelevance except there’s not really an alternative to thunderbird, maybe caliopen when it’s finally released. I stopped updating Thunderbird beyond v52 (on Linux) because the extension Toolbar Buttons doesnt work properly with later releases of Thunderbird. I’m technical support for about a dozen thunderbirds across various windows and linux distros, and I’m waiting for mozilla to finally die so firefox and thunderbird can be freed of the nonsense that mozilla imposes. Though Thunderbird is not as badly impacted as firefox because mozilla never considered thunderbird as worthy to focus on and abandoned it a couple times, current status is supposed to be life support by community though all official mozilla communication has been removed from their blog and there’s no clear indication of thunderbird current status. The latest changes to thunderbird are useless to me while actual requirements are still not met. I wish it were possible to get back the filtering of email that was removed recently and even to go back to the UI version with no tabs, would save me a lot of unnecessary support requests, basic privacy option such as protecting access with a master password has been removed more than a decade ago (or was it only in the mozilla suite and never ported to thunderbird). The sad reality is that afaik we’re short of a cross-platform opensource email client that sort of works, so thunderbird is the only option. You can find news on Thunderbird here https://blog.mozilla.org/thunderbird/ and everything else https://www.thunderbird.net/en-US/. There is still a master password as of latest Thunderbird 60.5.0 release. Thanks a lot for the information ! Well, I got Claws working on Win 10, fingers crossed it stays working. We’ll see. Still open to suggestions on other options.